The highest-resolution-yet temperature map and images of Saturn's icy moon Mimas obtained by NASA's Cassini spacecraft reveal surprising patterns on the surface of the small moon, including unexpected hot regions that resemble "Pac-Man" eating a dot, and striking bands of light and dark in crater walls. "Other moons usually grab the spotlight, but it turns out Mimas is more bizarre than we thought it was," said Linda Spilker, Cassini project scientist at NASA's Jet Propulsion Laboratory in Pasadena, Calif. "It has certainly given us some new puzzles." Cassini collected the data on Feb. 13, during its closest flyby of the moon, which is marked by an enormous scar called Herschel Crater and resembles the Death Star from "Star Wars." Scientists working with the composite infrared spectrometer, which mapped Mimas' temperatures, expected smoothly varying temperatures peaking in the early afternoon near the equator. Instead, the warmest region was in the morning, along one edge of the moon's disk, making a sharply defined Pac-Man shape, with temperatures around 92 Kelvin (minus 294 degrees Fahrenheit). The rest of the moon was much colder, around 77 Kelvin (minus 320 degrees Fahrenheit). A smaller warm spot - the dot in Pac-Man's mouth - showed up around Herschel, with a temperature around 84 Kelvin (minus 310 degrees Fahrenheit). The warm spot around Herschel makes sense because tall crater walls (about 5 kilometers, or 3 miles, high) can trap heat inside the crater. But scientists were completely baffled by the sharp, V-shaped pattern. "We suspect the temperatures are revealing differences in texture on the surface," said John Spencer, a Cassini composite infrared spectrometer team member based at Southwest Research Institute in Boulder, Colo. "It's maybe something like the difference between old, dense snow and freshly fallen powder." Denser ice quickly conducts the heat of the sun away from the surface, keeping it cold during the day. Powdery ice is more insulating and traps the sun's heat at the surface, so the surface warms up. Even if surface texture variations are to blame, scientists are still trying to figure out why there are such sharp boundaries between the regions, Spencer said. It is possible that the impact that created Herschel Crater melted surface ice and spread water across the moon. That liquid may have flash-frozen into a hard surface. But it is hard to understand why this dense top layer would remain intact when meteorites and other space debris should have pulverized it by now, Spencer said. Icy spray from the E ring, one of Saturn's outer rings, should also keep Mimas relatively light-colored, but the new visible-light images from the flyby paint a picture of surprising contrasts. Cassini imaging team scientists didn't expect to see dark streaks trailing down the bright crater walls or a continuous, narrow pile of concentrated dark debris tracing the foot of each wall. The pattern may appear because of the way the surface of Mimas ages, said Paul Helfenstein, a Cassini imaging team associate based at Cornell University, Ithaca, N.Y. Over time, the moon's surface appears to accumulate a thin veil of silicate minerals or carbon-rich particles, possibly because of meteor dust falling onto the moon, or impurities already embedded in surface ice. As the sun's warming rays and the vacuum of space evaporate the brighter ice, the darker material is concentrated and left behind. Gravity pulls the dark material down the crater walls, exposing fresh ice underneath. 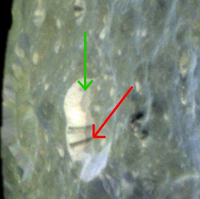 Although similar effects are seen on other moons of Saturn, the visibility of these contrasts on a moon continually re-paved with small particles from the E ring helps scientists estimate rates of change on other satellites. 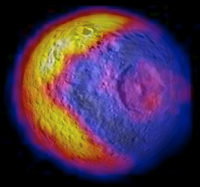 "These processes are not unique to Mimas, but the new high-definition images are like Rosetta stones for interpreting them," Helfenstein said. More information and images are available at http://ciclops.org, http://saturn.jpl.nasa.gov and http://www.nasa.gov/cassini. The Cassini-Huygens mission is a cooperative project of NASA, the European Space Agency and the Italian Space Agency. The Jet Propulsion Laboratory (JPL), a division of the California Institute of Technology in Pasadena, manages the Cassini-Huygens mission for NASA's Science Mission Directorate, Washington. The Cassini orbiter and its two onboard cameras were designed, developed and assembled at JPL. The imaging team consists of scientists from the U.S., England, France, and Germany. The imaging operations center and team leader (Dr. C. Porco) are based at the Space Science Institute in Boulder, Colo. The composite infrared spectrometer team is based at NASA's Goddard Space Flight Center, Greenbelt, Md., where the instrument was built.